Digital Humanities is a broad collection of scholarly activities that apply new technologies to humanities research. Some of its many facets include enhancing the scholarly lifecycle, preserving and illuminating collections that are otherwise difficult to access, encouraging new creative expression by using digital media, studying the impact of technology in the humanities, and providing cultural commentary. Digital Heritage is a subset of Digital Humanities that focuses on preserving and exploring our combined cultural heritage. Microsoft Research is exploring multiple applications of technology in service to the humanities. Our interactive storytelling initiative encompasses a number of Digital Humanities projects—such as WorldWide Telescope, Rich Interactive Narratives, Touch Art Gallery, AIDS Quilt page, and ChronoZoom—that are designed to enable individuals to explore the vast repositories of humanities data that exist, learn about our combined cultural heritage, and use this knowledge to develop insights that benefit the individual, organizations, and society as a whole. 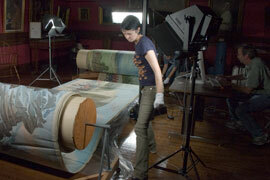 Additional efforts include WorkTop, which provides a unified workspace that helps Digital Humanities scholars capture, display, and link heterogeneous research documents; the Gigapixel Camera project, which is developing new hardware to capture data; and the Materials Simulation project, which uses various algorithmic approaches for modeling fabric and metal to bring ancient and fragile artifacts to life. In the near future, we plan to provide a number of free, open-source technology platforms based on RIN, ChronoZoom, TAG, and WorkTop to empower humanities and heritage research communities to combine data from many different sources and draw insights that can improve our understanding of humanity, culture, and society.